While the website hosting industry was still in its infancy, many businesses and personal sites owners were advised to avoid retaining their website hosting and domain registration under the same provider. One of the main reasons was to reduce a service provider’s monopoly over a company or someone’s online presence — like their web address and website content. For example, if users placed both their website and domain services under the same provider, but forgot to pay their hosting fees, the most likely repercussion would be their websites going down until their bills were paid. The situation worsened in the event of a prolonged billing dispute since users generally could not transfer their domains to a new registrar until the issue was resolved. However, if users had a different domain registrar than their website hosting provider, even if their bills were unpaid, they could easily forward the domain to a new site or sign up for a new website hosting service. Find your perfect TLD today — DreamHost offers 400+ domain extensions! Companies who let their domain names expire have always caused panic. For instance, in the late 1990s, Microsoft forgot to renew Passport.com that tied into Hotmail email services, resulting in a major disruption for users. During the early days of the internet, we could still accept excuses due to human negligence, especially as not every person was well-versed in managing multiple providers of domain names and website hosting. Furthermore, many domain registrars enforced very strict rules of no mercy when a customer’s domain name expired. However, even today, tragedy can occur. This summer marketing software giant Marketo.com forgot to renew its domain name at Network Solutions. In the wee hours of July 25, the Marketo.com website disappeared from the internet, while millions of client emails and tracking links ceased working. This was a disaster for a company that has a market value of about $2 billion. 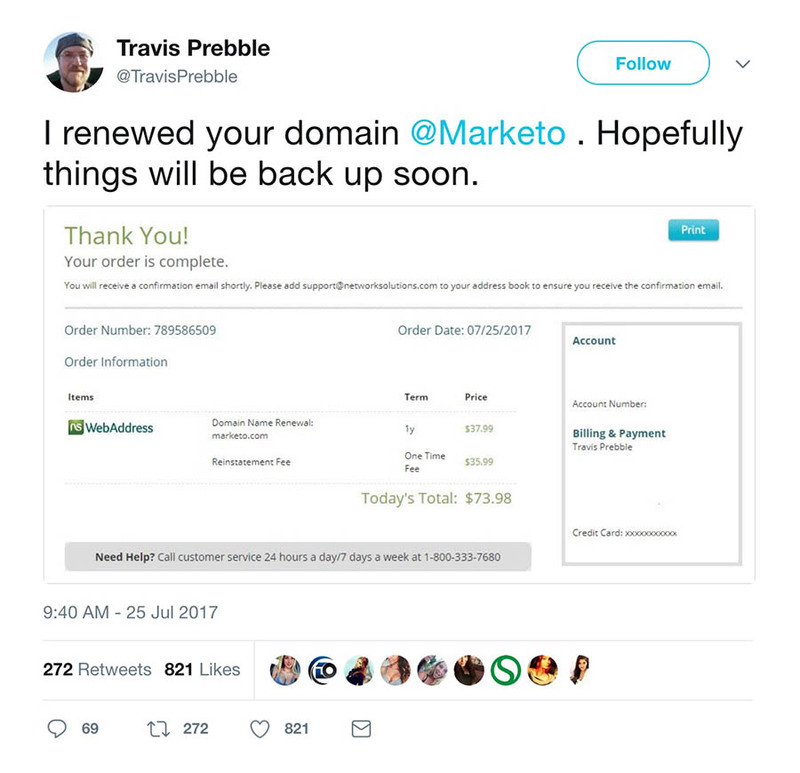 Luckily, one of Marketo.com’s clients voluntarily renewed the expired domain name with his own credit card and tweeted the invoice to the company. The site returned to normal before noon on the same day. Today, there are numerous reasons why users should keep website hosting and domain registration under one roof — and not just to avoid Marketo’s mistake. But don’t take it from us. Listen to our customers. In June 2017 we surveyed 1,775 customers who had successfully transferred a domain registration to DreamHost. We had 184 responses from around the world, which represents a more than 10 percent response rate. 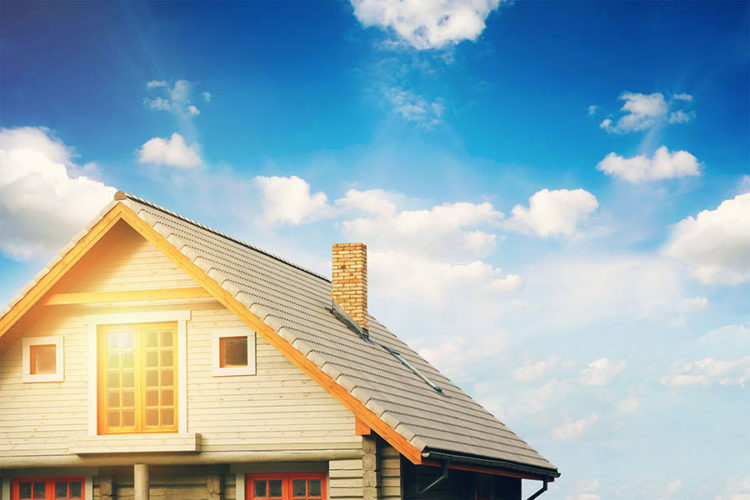 From the responses, we were able to identify several key reasons why our customers wanted to keep their web hosting and domain registration under one roof. One of the most important questions we asked was why our customers decided to transfer their domain registration to DreamHost. More than 60 percent of the customers surveyed responded that it was the ability to manage several websites and domains under one account. Over 56 percent of survey respondents selected “good price” when asked why they decided to transfer their domain registration to DreamHost. Purchasing a domain and website hosting together can save some money since many providers provide free domain registration to hosting customers. If users manage several websites, it can be a saving of hundreds of dollars per year if you bundle the two services together. Didn’t buy your domain with DreamHost? It’s easy to transfer your registration. Another 26 percent of survey respondents selected “easily upgrade to website hosting” when asked to explain their decision. We take that to mean that our customers plan on expanding their web presence, and keeping their domains close to quality hosting plans is a strategically sound move. 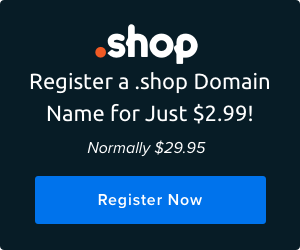 As we mentioned earlier, sometimes a domain registrar can damage an established business reputation due to an expired web address. The best solution: keeping domain names and website hosting services in one account. Remember, always pick a reputable service provider, such as DreamHost. We’re an ICANN-accredited domain registrar and have been in the hosting business for 20 years.